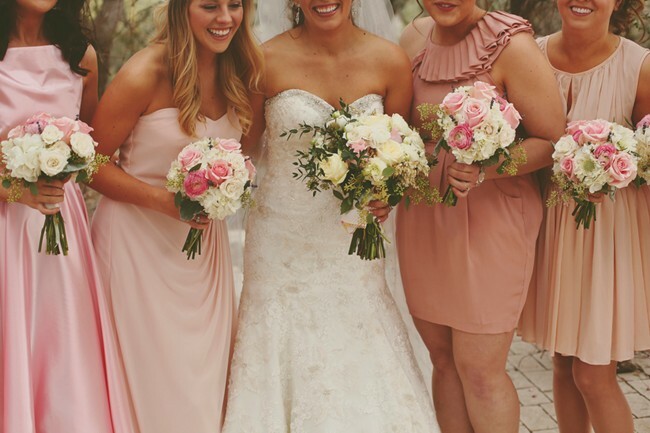 My goal in today’s post is to provide simple tips for brides who are deciding whether or not to have mismatched bridesmaids dresses. I decided to just have a Maid of Honor at my wedding, and let me tell you, it made my life a whole lot easier. 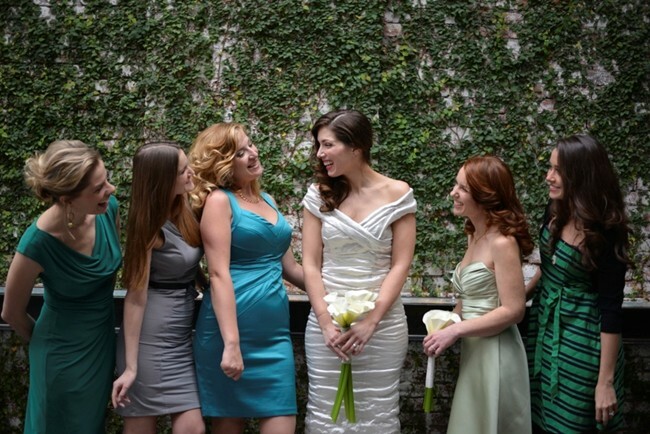 I didn’t have to deal with different body types, heights, budgets, endless selection of dresses and female opinions. 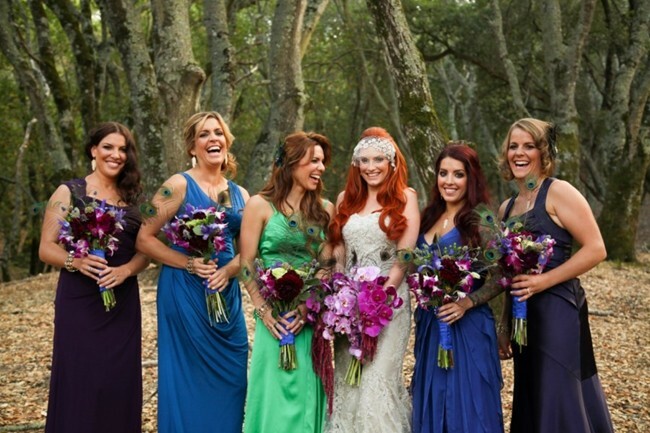 The mismatched bridesmaids dress look has been a big trend over the last few years and can look amazing if done right. 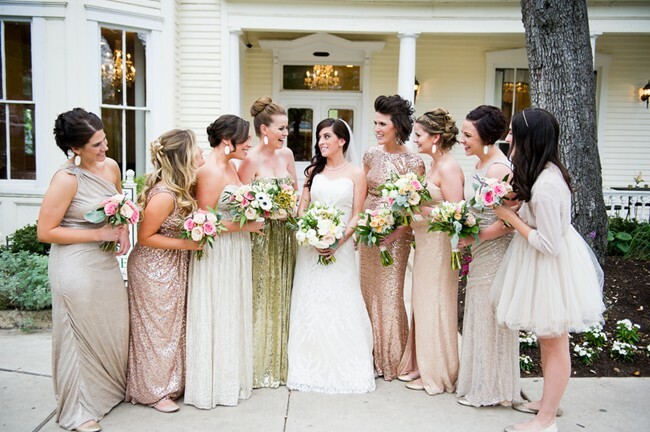 Whether you choose different dresses in the same color, different dresses in the same shade, or the same dress in different shades, one key to success is to make your girls look cohesive. 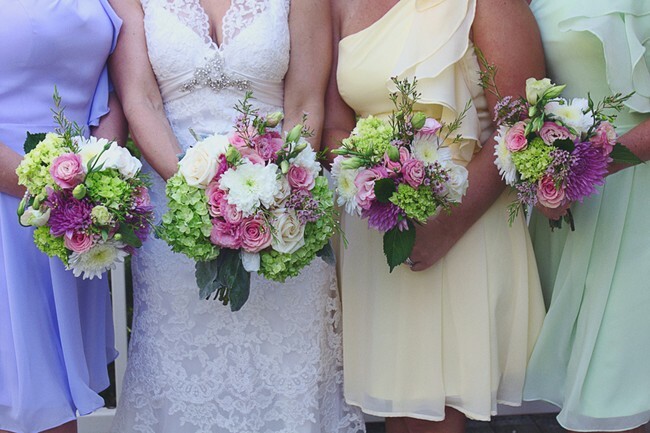 Use accessories, shoes, bouquets and hair styles to your advantage and tie everything together to create that perfect mismatched look, even when no one is wearing the same dress. The almighty convertible dress is a perfect solution for any picky party. 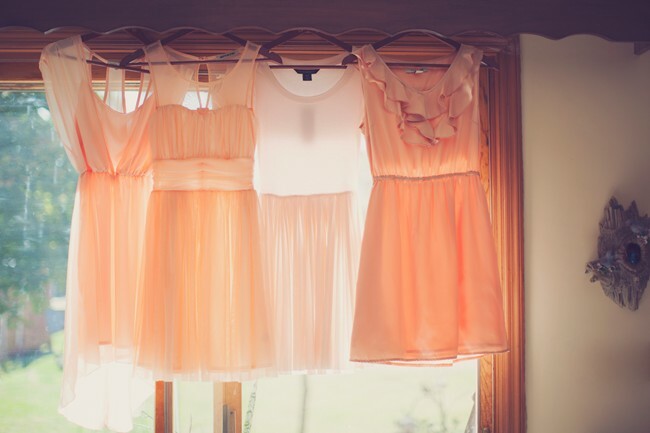 These dresses are gorgeous and can be styled in many different ways. 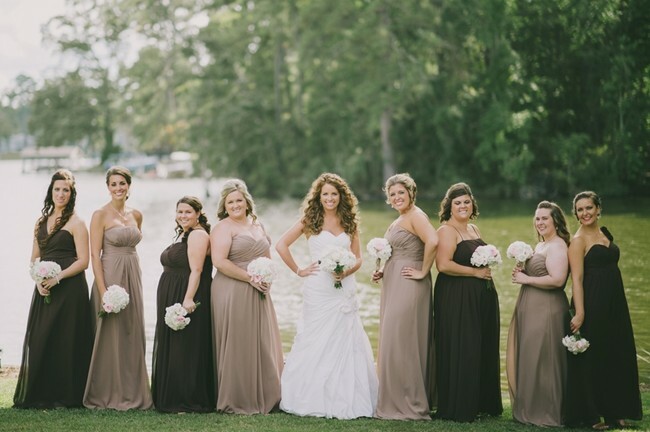 Even though the bridesmaids are in the same color and style of dress, they can add their own spin to the upper half and make the dress unique to their taste. 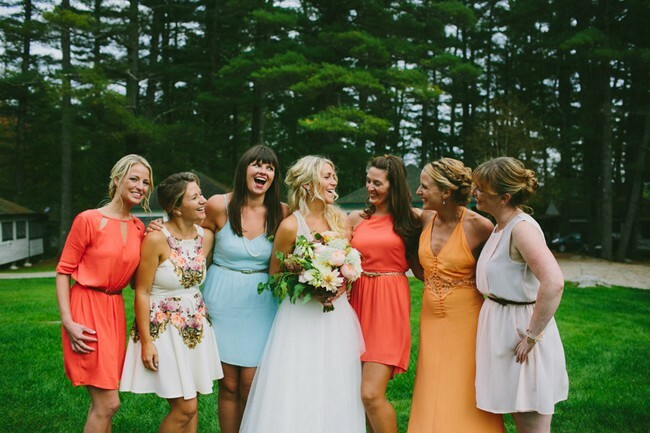 Give your bridesmaids a little leeway and freedom to wear what they want to wear. 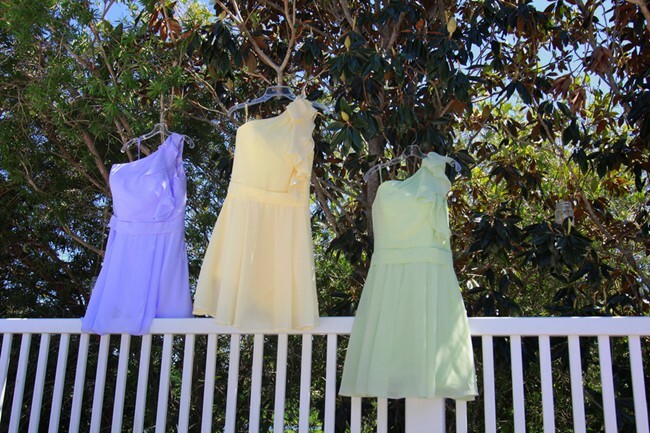 If you can’t find a convertible dress, but you still want each girl to feel comfortable and have their own unique flare in the same color, then find a store that offers multiple dress styles and color options. 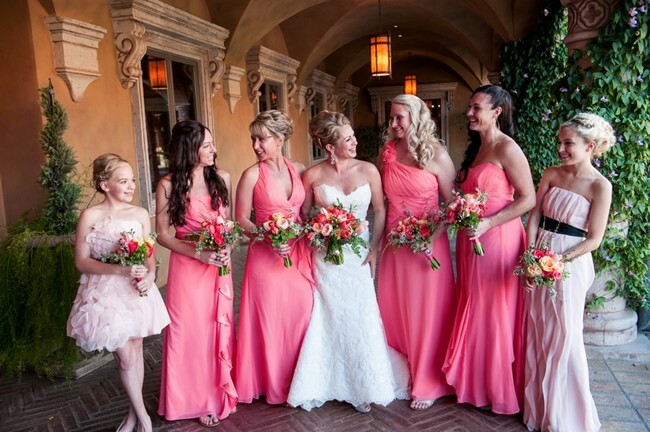 The ultimate bridesmaid dress stores that offers just that, are both Dessy and David’s Bridal. 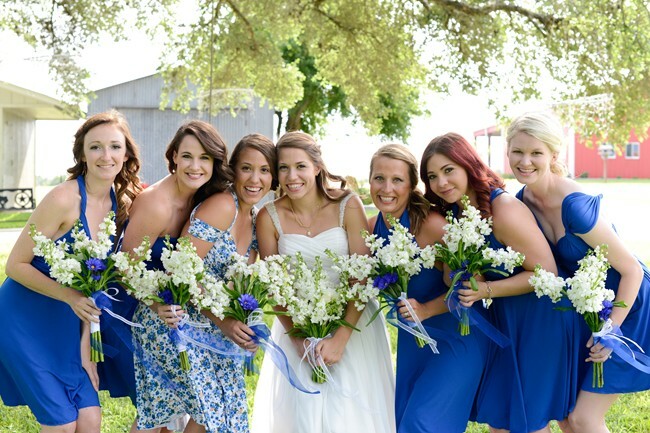 Adoring guests will figure it out once you’re at the altar, but best to keep this look for bridal parties with three or more bridesmaids. 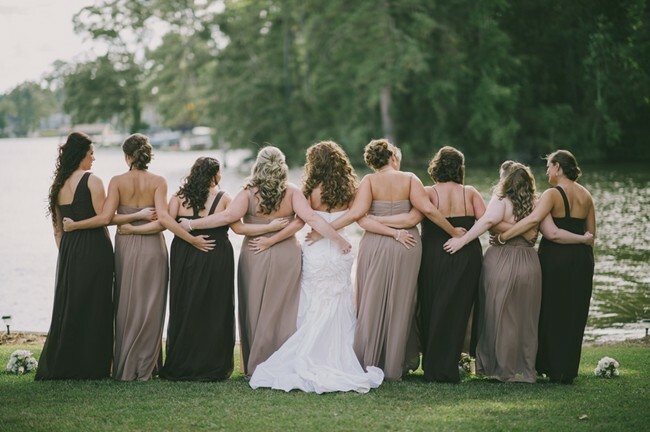 This is a fairly easy option if you have already picked dresses, or if you have come to an agreement and let bridesmaids choose the color that they think would look best with their skin tone. As you can see from the photos below, a different dress with the same shade can look smashing. 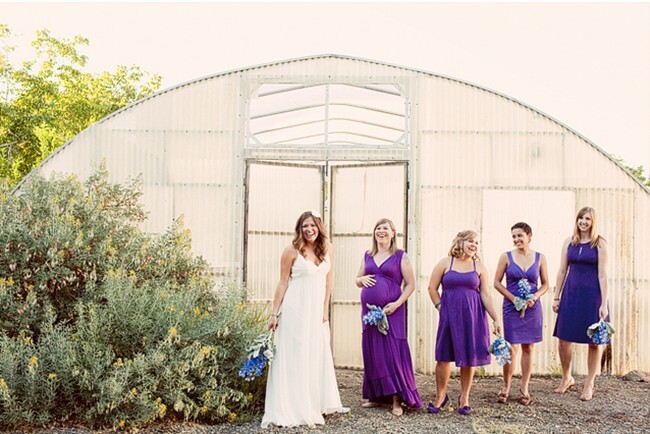 Tip: pickup a paint swatch from your local hardware store so that your bridesmaids have a little guidance on the shade of their dress. They can then take the swatch to the dress store and quickly narrow down their option. 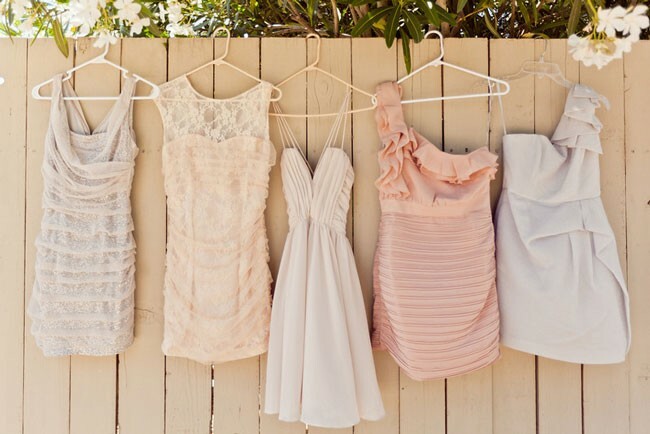 Dresses that are all the same length will complete your bridal fashion look. 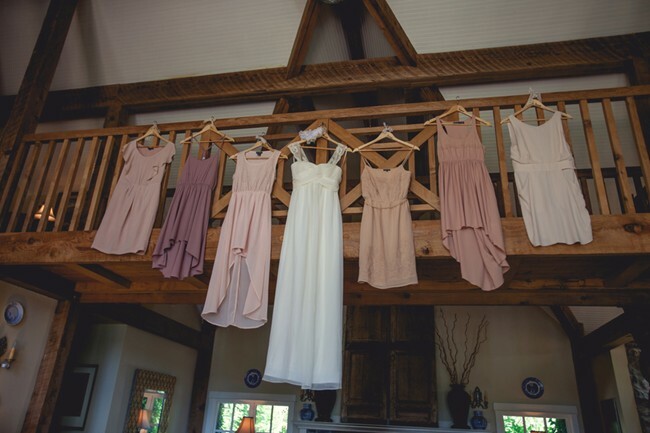 Get them to check out BHLDN for some beautiful gowns that have similar shades. One size doesn’t fit all, and sometimes budgets don’t either. 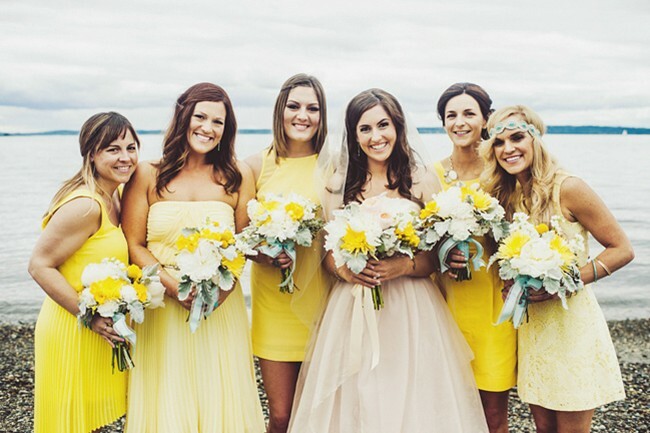 Most bridesmaids dresses range from $100-$300. 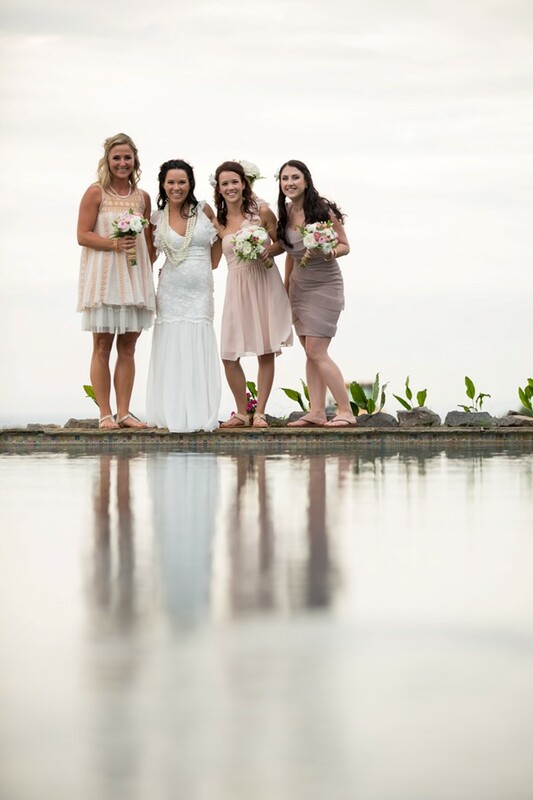 If you decide to let your bridesmaids choose a dress, at least give them some guidelines so that there will be some cohesiveness. 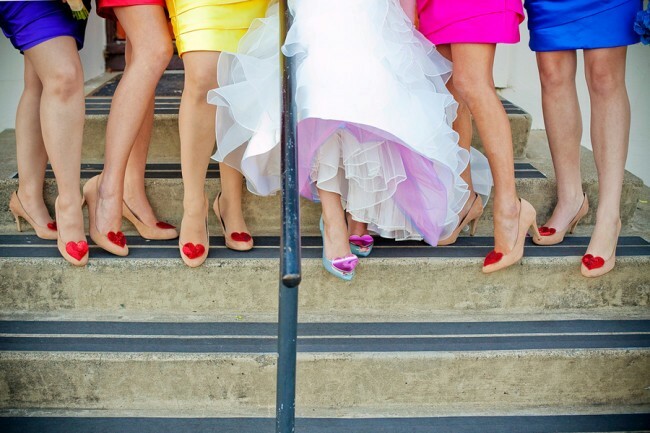 Your bridesmaids may not know your vision, so tell them what to choose in terms of color, texture, material, length, or style. 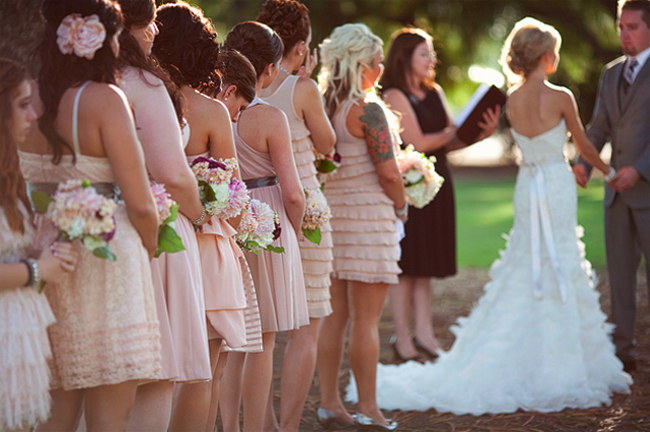 Once everyone is on the same page, let the dress shopping begin! A great place to start is Nordstrom. As above, go to a local hardware store and find a paint swatch in your color. 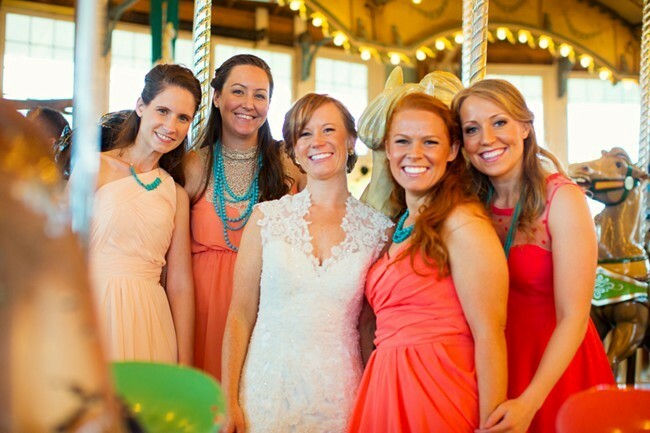 Provide each bridesmaid with a swatch to give them a better idea for narrow down options. Try to keep the dress lengths the same. 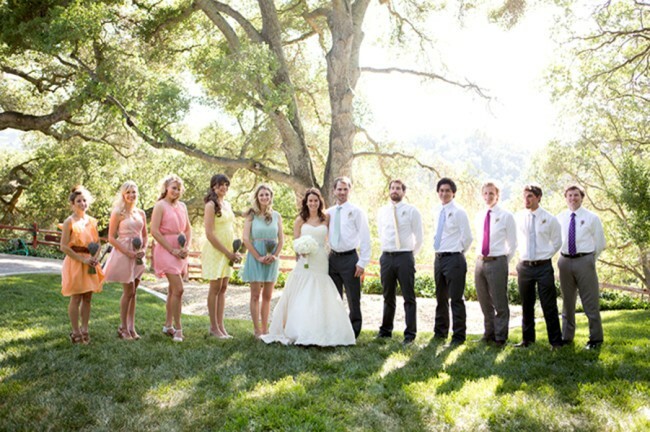 The wedding party below looks like they were given a color range between grey/blue, peach and pink, with instructions of an empire waist and belt. 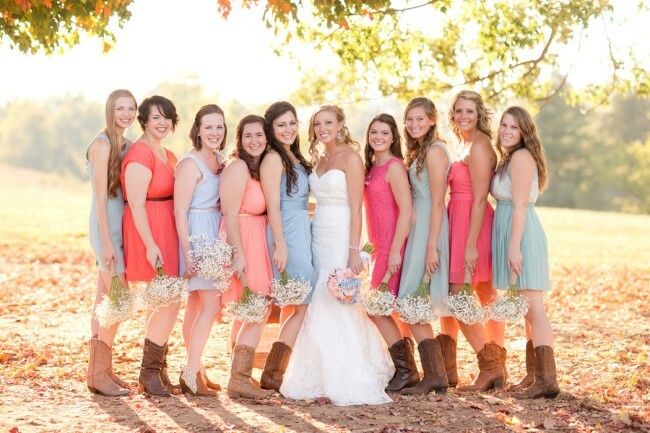 The bridesmaids completed the look by wearing their hair down, same bouquets, and most importantly mandatory cowboy boots! See, it can work! 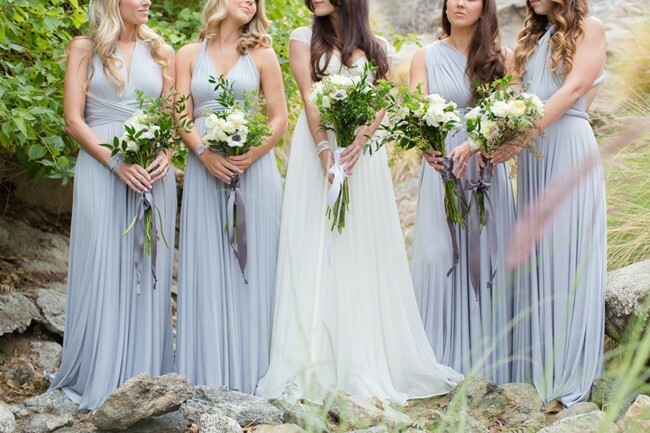 The whole matchy-matchy bridesmaids dress look actually goes back to ancient Roman times (your history lesson for the day!). 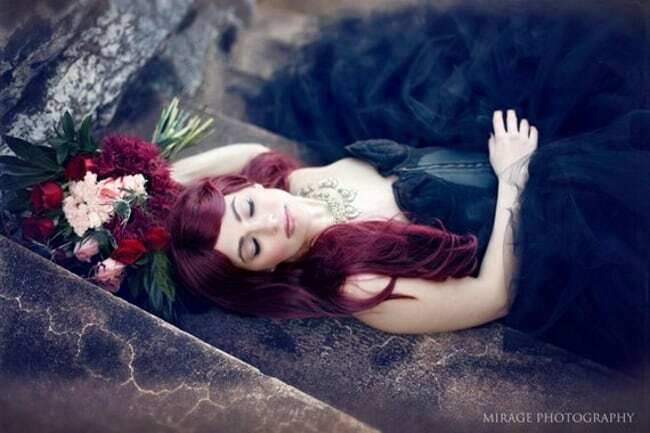 A wedding back in ancient Rome required 10 witnesses to dress like the bride and groom to ward off evil spirits. When Queen Victoria stepped up to say “I do” back in the 19th century all her bridesmaids wore white dresses similar to her. Those traditions came over to North America and to this day we follow the matchy-matchy look. Except, we’ve now changed up the color. 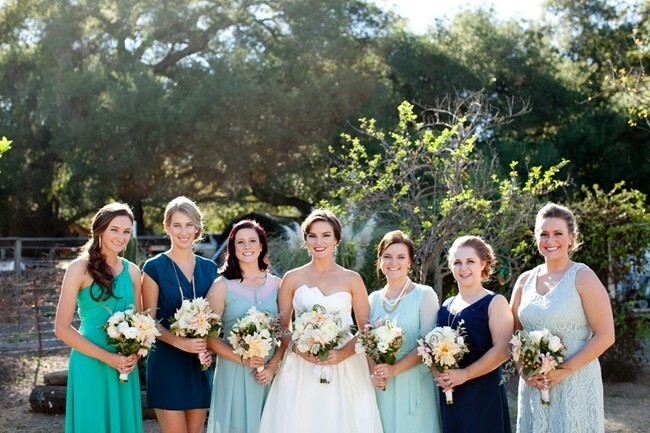 Let us embrace this change even further and let bridesmaids wear whatever they want! 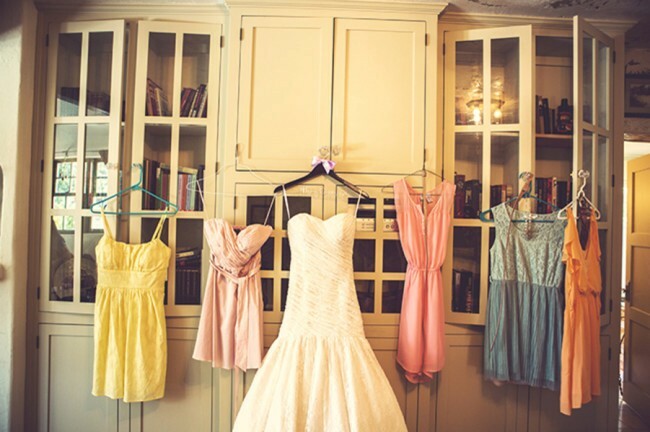 I hope these tips inspire you to give your girls the freedom to choose the dress that suits them best. First off congrats Eleesha! All very exciting. So they are all in the same color blue except one of the girls who is in offish color blue -correct? Is she the MOH by any chance? You can make it work especially if you accessorize them all the same (ie. shoes, necklace, bracelet) Also, because you are going for the bohemian casual backyard style wedding, it can work as well because it is less formal type affair. Please feel free to send us photos. – (info@www.loveandlavender.com) We can then see what they look like and give you better feedback. I love the mismatched look!